We practiced singing this song with sign language again this week. 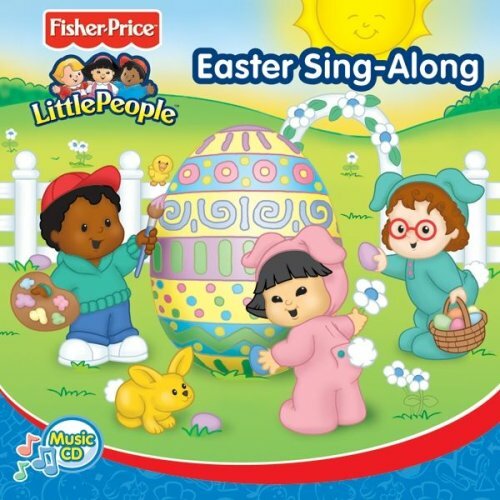 A bunny version of “If You’re Happy and You Know It.” This can be found on the Fisher-Price Easter Sing-Along Album. A boy wakes up one morning with a bunny on his head. 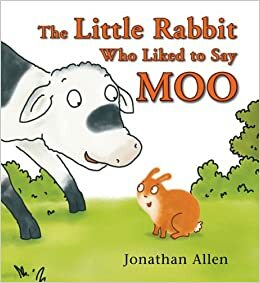 His mother is a bit perturbed, but the bunny explains that “you can do anything with a bunny on your head – books can be read, peanut butter and jelly can be spread….” This is a silly book with short sentences, lots of repetition and adorable pictures. A bunny and his friend mouse find lots of mischievous ways to have “bunny fun,” when they are stuck inside on a rainy day. 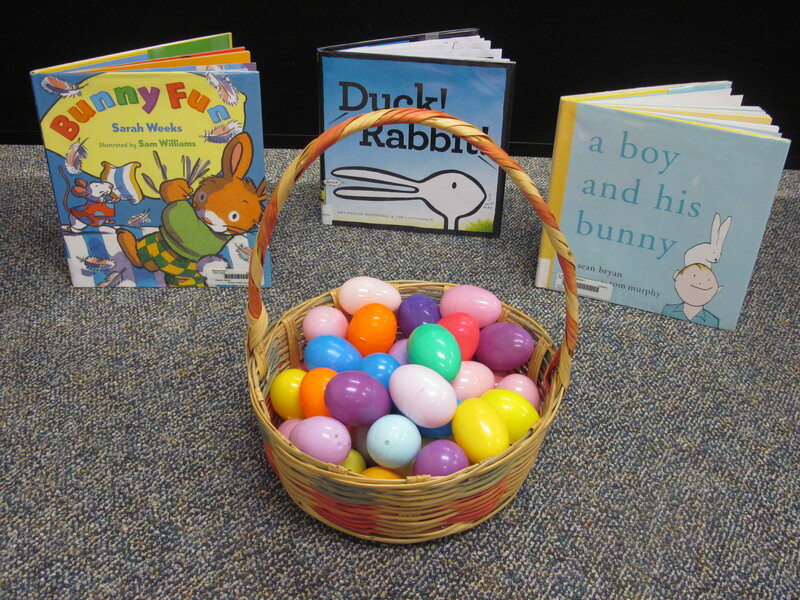 Bright pictures and easy, rhyming text make this a great read-aloud. 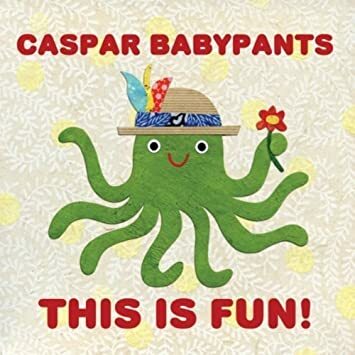 SONG: Mister Rabbit from Caspar Babypants’ album This is Fun! I used shaker eggs with this song. Start out by just keeping time with the shakers, then add in more actions with each verse. Is it a duck? Or is it a rabbit? …you decide! CRAFT: Duck! Rabbit! After reading Duck! Rabbit! we made our own version to take home. 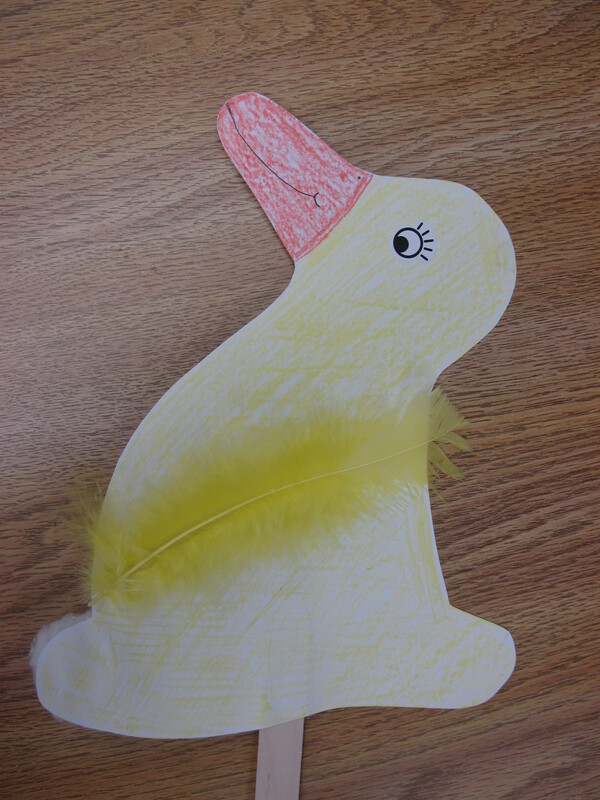 You can print my Duck-Rabbit template here. 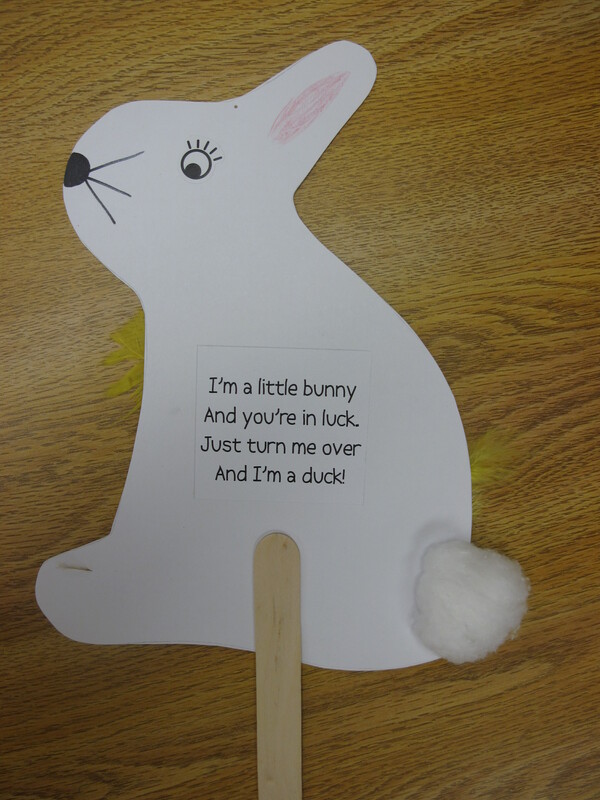 You can print the Duck Rabbit saying here. Now be quiet as an egg, thank you. A cute, simple book that will have kids making all sorts of animal noises. This would translate well into a flannelboard too! Wow, this is really really neat stuff! I LOVE it! I’m running a toddler music time. I am so glad I found your website, because I will definitely be using your ideas. Thanks so much for all your hard work. I got a lot of tips and ideas reading through your postings. Could you post some video clips of your actual class? That would be amazing. Thank you. Thank you Lea! We’ve thought about adding video clips in the past, but uploading video to the blog requires a significant upgrade (and cost.) And since we do this all for free, we try to keep our costs to a minimum. 🙂 Even if we were to use YouTube, we then run into copyright issues. Specifically, we are not able to post any videos of us reading books, because the content of those books has been copyrighted. Same goes for any purchased music or rhymes from published books. Definitely a great suggestion, and something that we’ll keep thinking about!